Market conditions were challenged with spiking correlations and negative sentiment presenting headwinds for stock pickers. Earnings trends were the only bright spot. Each quarter, we assess the market conditions for active management in our Wall Street Mood Monitor, a model that gauges the current climate based on three factors: correlations, sentiment and earnings trends. In a matter of months, two of those factors have turned negative. The biggest change is the jump in correlations. Escalating trade tensions and fear of a weakening global economy sent markets tumbling and, perhaps not surprisingly, stock correlations rising. At the end of the fourth quarter, intra-market correlations for the Russell 1000 Index stood at 0.64, well above the long-term average of 0.55. Correlations have been quite volatile in 2018, entering the period at a 15-year low, spiking in April, turning lower again in the middle of the year, only to jump again in the fourth quarter. Higher correlations imply individual, stock-specific characteristics are mattering less to investors. High correlations normally correspond to difficult environments for active managers, but they aren’t the only mounting headwind. Sentiment has also cooled on Wall Street. We gauge sentiment by comparing the total number of upward and downward revisions to all sell-side analysts’ corporate earnings estimates. In December, the percentage of earnings estimate upgrades was only 39%, the lowest rate since early 2016. Pessimism was widespread, with only the utilities and consumer discretionary sectors recording more upward earnings revisions than downward ones. 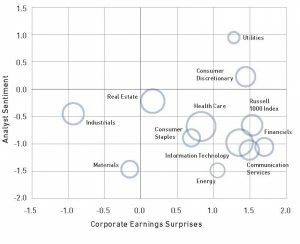 Analysts were least constructive on the materials, energy and communications sectors, where at least 70% of earnings revisions were negative. The only bright spot on our three-factor model this quarter was earnings strength. For the fourth quarter, 55% of stocks beat consensus earnings estimates by at least one standard deviation. Conversely only 12% of companies reported earnings that were a standard deviation below consensus expectations. The rate of companies significantly beating estimates is down 5% from last quarter but remains near all-time highs. Meanwhile, the percentage of companies reporting significantly disappointing results is hovering near an eight-year low. 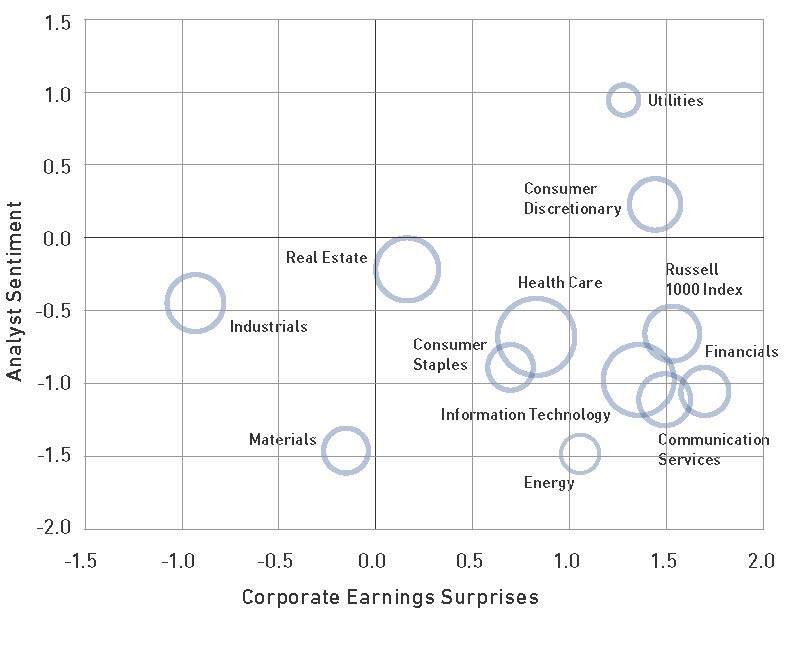 Earnings trends were strongest in the technology and communication services sectors, where the percentage of companies significantly beating consensus earnings estimates stood at 71% and 59% respectively. Are Earnings the Next Shoe to Drop? While analysts are revising more earnings estimates downward, that doesn’t necessarily mean corporate earnings are poised to fall. True, a slowing global economy would indeed be a challenge for earnings. But we would caution that in our 15 years of collecting data on analyst revisions and corporate earnings, revisions have not been a reliable leading indicator of future earnings or the direction of the market. If earnings do start to disappoint, it would pose a further challenge in an already difficult backdrop for active management. The views expressed are those of the author at the time created. These views are subject to change at any time based on market and other conditions, and 361 Capital disclaims any responsibility to update such views. No forecasts can be guaranteed. These views may not be relied upon as investment advice or as an indication of trading intent on behalf of any 361 Capital portfolio. This 361 Capital blog is not intended to provide investment advice. This blog should not be construed as an offer to sell, a solicitation of an offer to buy, or a recommendation for any security by 361 Capital or any third-party. You are solely responsible for determining whether any investment, investment strategy, security or related transaction is appropriate for you based on your personal investment objectives, financial circumstances and risk tolerance. You should consult your legal or tax professional regarding your specific situation. This website is not a solicitation for the Funds outside of the United States. © 2019 361 Capital LLC. All rights reserved.